Michael McFadyen's Scuba Diving - Camp Cove One of Sydney's most popular, but also most ridiculed, dive sites is Camp Cove. 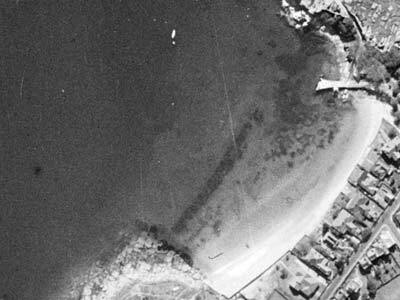 Located on the southern shore of Sydney Harbour, Camp Cove is a site that can can have extremely good or very awful conditions, mostly dependent upon the prevailing weather. Protected from all but cyclonic northern swells, the site is especially suited when southerly winds are blowing and the seas are too big elsewhere. One drawback with the site is that because it is located in the Harbour, after periods of rain the visibility can drop to only one to two metres. Average visibility is in the order of four to five metres but I have encountered 9 to 12 metres a few times. Despite these comments, even in two or three metre visibility you can have a fantastic dive. 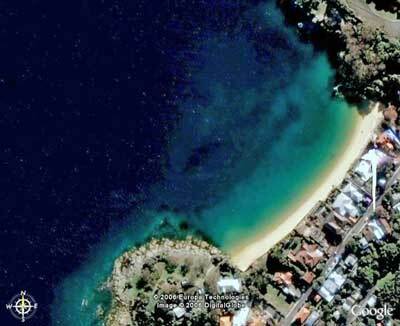 Situated at Watsons Bay just inside South Head, Camp Cove is a small beach only 250 metres long and as narrow as three metres at high tide. The beach is backed by luxurious homes that most of us can only dream about and either end of the beach is part of Sydney Harbour National Park. You get to Camp Cove by following New South Head Road from the city or Old South Head Road from the southern or eastern suburbs. Once you get to Watsons Bay, go past the Watsons Bay Hotel into Short Street (follow the Camp Cove sign). There are basically two dives that you can do here. The first starts from the southern (city) end of the beach and is generally known as Green Point. Access to this dive is by parking in the small car park at the end of Pacific Street, which is the first on your left when you enter Short Street. The second and more popular dive is the northern end of the beach and is the dive site commonly called Camp Cove. There is another bigger (but still very small) car park located in Cliff Street, found by following Short Street and the one way streets. Parking spots are at a premium in the entire Watsons Bay and Camp Cove areas, especially in summer. If you do dive here on a summer weekend arrive early and do not even consider parking illegally as you are almost certain to get booked. Even late in the afternoon in Summer can mean trouble finding parking. After parking in the Cliff Street car park, gear up and walk the short distance down the street to the water's edge. A ramp runs down onto the beach adjacent to the kiosk. The entry and exit point is from the beach. Except as indicated in the first paragraph, it is virtually impossible to have the site blown out so you should never have trouble entering the water. The map at left of the dive site will help give you a better understanding of Camp Cove. The dive site itself consists of a low reef running parallel to the beach which juts up a metre or two from the surrounding sand and the rocky headlands at either end of the cove. A lot of people are not even aware that this reef exists. I usually start the dive straight in front of the kiosk and take a bearing on the Sydney Harbour Bridge (about 240 degrees). I then submerge and swim out over the sand until I reach the reef. From here you can go to the south along the eastern side of the reef. On the way to the reef, carefully check the sand and any vegetation or fixed marine fauna on the way. A lot of times you will find sea horses, tiny pygmy leatherjackets or cuttlefish hidden in them. 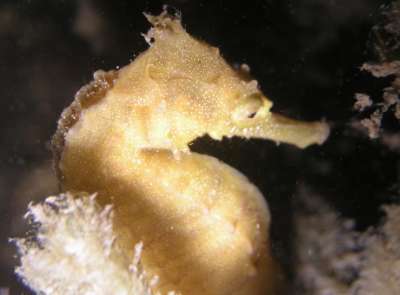 On 11 January 2004 I found two White's sea horses on the way to the reef. See a photo of one below. As you move along the reef, examine all the small overhangs and look down the cracks in the reef. Sometimes there are very interesting things hiding here. Also, check out all the old beer and soft drink bottles on the sand. Some are very old, more than 50 years (most have dates on the bottom). After passing four or five cracks, follow one to the west and then head north till you reach the north-west corner of the reef. Again, carefully examine the sand area. The maximum depth so far will be about 4.3 metres on low tide and almost 6 metres at a very high tide. From the corner, swim due north for about 100 metres until you reach the headland. The depth over this part will be 5 to 5.5 metres at low tide (6.5 to 7 metres high tide). Keep watching the sand as some rarer fish can be seen in this area including pygmy leatherjacket, smooth anglerfish, eastern frogmouth and tiger pipefish. You can also see octopus, the deadly blue-ringed octopus, stripped dumpling squid, small cuttlefish, stingaree and other interesting fish in this area and the sides of the reef. A lot of squid are also here as well as sometimes sea hares in their hundreds. 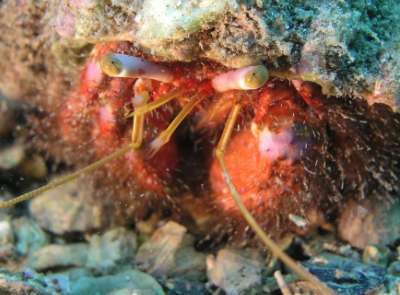 There are always hermit crabs here and sometimes heaps of them. When you reach the headland, follow the wall to the left where you will see a mixture of small boulders and huge rocks, some almost reaching the surface. A number of swim-throughs are located between the wall and the rocks. A few large overhangs and some smaller caves add to the site. There are a lot of leatherjackets along here. When the depth comes up to three or two metres and the sand is a very clean variety, it is time to turn around. Your dive time to here will be about 40 to 45 minutes depending upon your rate of travel. Return to the beach by following the wall. When you pass the large rocks where you met the wall, keep going and you will see a few more and then the wall gets less prominent. You will go over a jumble of small rocks that were part of the original Water Police Wharf. Sydney's first Water Police ran from here and the house behind the kiosk (now part of Sydney Harbour National Park) was his. The first harbour pilots also operated from the site. This jumble of rocks is home to common or White's sea horses. They are pretty elusive but can sometimes be found after careful searching in the kelp on the rocks. On a night dive in December 2000 I found five sea horses in this area. Just past here I found two sea horses on the sand on small sponges on 11 January 2004. Continue to the south until you reach clean sand again and you will be near the beach. Turn to the east and you should hopefully exit near the kiosk. There is a shower below the nearest wooden steps to your left and a tap is on the side of the kiosk where you can wash off any sand. Toilets are provided at the top of the stairs closest to the car park. Another thing that must be remembered here is that you should never, repeat never, ascend from the reef, even if you have lost your buddy. In summer, and at other times, there are all sorts of boats anchoring and manoeuvring in this area. Unfortunately, due to the nature of the persons (less kind writers would call them yuppie idiots), a lot have little regard for divers or the environment as you will discover from the huge amount of rubbish, mostly champagne and wine bottles, that they sometimes throw into the water. If you are lucky you might even find valuables lost overboard. Apart from sea horses, bottles and sunglasses, you will also see velvetfish, smooth flutemouth, old wife, fan-bellied leatherjacket, blue-ringed octopus, cuttlefish, pipe fish, blue swimmer crab, eastern kelpfish, combfish, senator wrasse, sawtail surgeonfish, mulloway, moon wrasse, flounder, eastern fortesque and blue groper. In December 2000 I even saw a squid attacking and eating small, silver/red fish (there were thousands of them annoying us throughout the dive but I have no idea what they were). An amazing sight. This is an excellent night dive, one of the best in Sydney and extremely safe even for novice night divers. Just do the same dive as described above.